Sunbury, PA—At its June 2010 Annual Business Meeting, the Accrediting Commission of Career Schools and Colleges (ACCSC) will recognize Triangle Tech located in Sunbury, Pennsylvania as a 2010 ACCSC School of Excellence. Triangle Tech, Sunbury, was recognized and awarded the School of Distinction in June 2005. In October 2009, Triangle Tech Pittsburgh, Greensburg, and DuBois were awarded the School of Excellence. 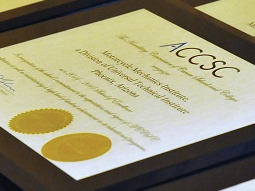 In 2004 the School of Distinction Award from the Accrediting Commission of Career Schools and Colleges was awarded to Triangle Tech, Pittsburgh, PA; Triangle Tech, Erie, PA; Triangle Tech, Greensburg, PA; and Triangle Tech, DuBois, PA.